Italian superyacht builder Tecnomar, a brand under the Italian Sea Group umbrella, is expanding to the far east market with a recent order for a new EVO 115 (35m). Tecnomar’s EVO series is a sporty, planing group of superyachts that are built in composite or aluminum depending on the size. The EVO 115 will be built in aluminum with a planing hull capable of reaching a top speed of 27 knots according to the company’s press release. The EVO 115 also represents the first superyacht the Italian Sea Group has sold to far east clients. According to Tecnomar the yacht is expected to cruise the far east extensively and will be built with a custom interior and exterior layout to ensure that all features and amenities the emerging market desires will be found on board. According to Tecnomar’s press release the new EVO 115 will boast a spacious three cabin layout with the master designed to utilize the yacht’s full beam on the lower deck. 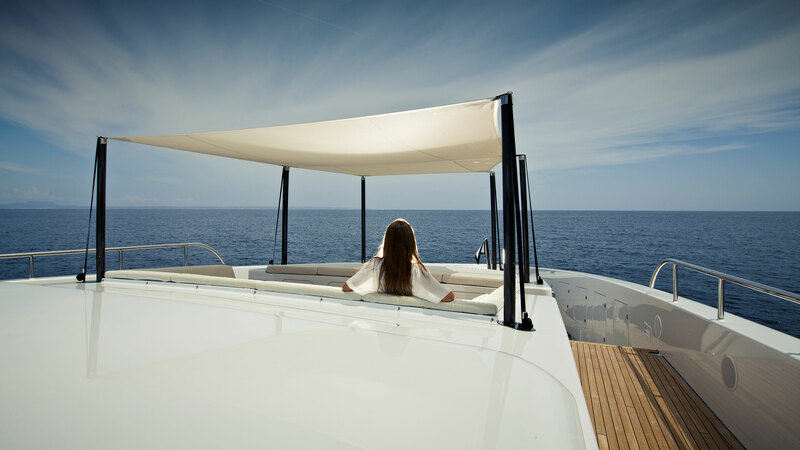 Some of the amenities planned for the new yacht include a fully equipped spa with features including a sauna and steam room in addition to a jacuzzi and large common gathering areas inside and outside. The new EVO 115 represents an impressive array of guest accommodations and luxurious amenities packed inside a 115′ (35m) hull.